Frontiers in Anti-cancer Drug Discovery covers important advances in the field of drug development with particular focus on research on drugs in advanced stages of development, clinical trials and applications. This Volume published under the editorship of Prof. Atta-ur-Rahman aims at providing readers with an update on contemporary research. The research articles are comprehensive and have been written by an impressive group of authors, most of whom are well known for their own contributions in the field of drug research. This eBook should be of significant interest to Ph.D. students and established researchers. I commend the editor, Prof. Atta-ur-Rahman, and all the contributors for this well written volume which highlights the quest for a cure for cancer. Cancer remains second leading cause of death, after cardiovascular diseases. Efforts to understand cancer at the molecular level have led to the emergence of many new disciplines at the interface of chemistry and biology. The discovery of new molecular targets and new molecular entities which can modulate the molecular functions, combined with the advent of enabling technologies for early diagnosis and disease progression, as well as better drug delivery vehicles, create a new hope for the treatment of most cancers, if not all, in the near future. 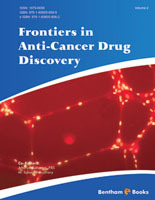 The eBook entitled “Frontiers in Anti-Cancer Drug Discovery”, is an excellent show case of the various approaches the researchers are undertaking to address the issue of cancer prevention and treatment. All chapters, with the exception of chapters 2 and 3, address a distinct issue and provide research based solutions. Chapter 1 contributed by Michael Luis and Ramon Andrade de Mello, reviews the importance of human epidermal growth factor receptor 2 (HER2) as a potential target for the treatment of the second most common cancer type, gastric cancer. The authors support their hypothesis of HER2 as an important target for drug discovery and development by numerous studies, conducted in recent past. HER2 and its role in gastric cancer progression and development of resistance against cancer chemotherapies are presented in a reader friendly manner. Chapter 2 and 3 contributed by Mohammad F. Ullah et al., and Priya Batra et al., respectively, highlight the importance of natural products in cancer chemoprevention and treatment. Chapter 2 provides an excellent overview of scientific and clinical studies conducted on cancer’s preventive role of dietary phenolics. They have mentioned the examples of various well known plant phenolic constituents, obtained from fruits and dietary herbs, and describe their chemopreventive role by modulating the essential cellular pathways involved in cancer proliferation and metastasis. In chapter 3, the authors have also focused on a class of plant phenolics, flavonoids of dietary origin and reviewed their possible action in the prevention and treatment of various cancers. Interactions of plant-based flavonoids with proteins and other dietary components are also reviewed. Chapter 4 contributed by Milos Dokmanovic et al., focuses on an emerging class of therapeutics, anti-body drug conjugates (ADC). The authors have taken a holistic view of the topic by describing the history, current status of development and future prospects. These recent developments have made it possible to use ADC as serious candidates for cancer treatment. The results of recent clinical trials and synthetic strategies to develop novel ADCs have also been nicely described in this chapter. Mireia Agirre et al., in chapter 5 address the potential and prospects of virotherapy against cancer. This new approach, though it has suffered from a lot of technical hurdles, now appears to be practical and promising. Specially interesting is the fact that synthetic viruses have the capacity to manipulate aderoviruses to target cancer cells. This makes the field scientifically exciting and therapeutically promising. Chapter 6 by Rohit Mathur et al., identifies peptidyl-prolyl isomerase PIN1 as a novel target for cancer treatment. PIN1 up-regulation in tumor cell and its role in protein post phosphorylation events makes it an attractive target for drug discovery. PIN1 inhibitors as anti-cancer agents and as adjuvants deserve special attention. Sean M. Lawless et al., review the details of molecular cascade involved in the glioblastoma invasion in chapter 7. Glioblastoma is among the deadliest of human cancers with an amazing tendency to invade other regions of the brain. The authors have reviewed the molecular mechanisms involved in glioblastoma invasion and identified numerous molecular targets for possible drug development. Last but not least, chapter 8 contributed by Georgi Ts. Momekov et al., reviews an exciting development in drug delivery. The use of nanopharmaceutical agents holds great promise. Drug delivery vehicles with nanoparticles not only have improved therapeutic indices but also improved stability and solubility and lower toxicity associated with cancer chemotherapy. This delightful feast of well written scientific articles on topics of general relevance, makes this book a “must to read” for practitioners, scientists, and students. We must thank the contributing authors for making this volume an important treatise of scientific knowledge. We are also profoundly grateful to the editorial staff, particularly Mr. Mahmood Alam (Director Publication) and Ms. Hira Aftab (Assistant Manager) for their hard work and persistent efforts.